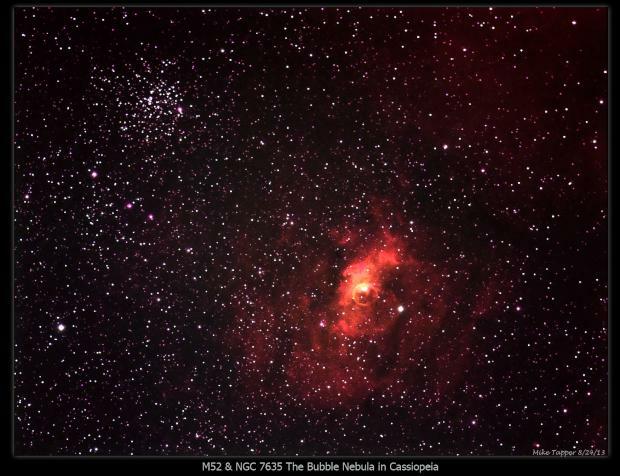 The Open cluster M52 shares the FOV with the NGC 7635, the Bubble Nebula in this narrow band image taken under a full moon on 8/24/13 from Nazareth, PA. Ha=7x10min. OIII & SII=5x10min each. Nebulosity capture & process, PHD guided. PS CS2 post processed. SBig STF 8300M CCD, WO 110 Apo triplet.